There is perhaps no lineage in gaming more storied than that of the Final Fantasy series. Since its 1990 debut on the NES, North America has seen the release of nearly 50 titles in the franchise, from story-driven sagas and real-time strategy games to cart racers and minigame collections. Clearly, the old joke goes, there is nothing particularly “final” about this fantasy. A more appropriate (but perhaps less catchy) title might be “Iterative Fantasy,” since Japanese developer Square Enix has demonstrated an uncommon commitment to tweaking, refining, and occasionally overhauling its games from version to version. Final Fantasy XIII represents the latest iteration of Square Enix’s role-playing formula, and though many significant changes have been made to the game’s design and mechanics, its narrative feels as familiar as ever. Ragtag bunch of heroes? Check. Improbably-proportioned weaponry? Check. Fabulous hair? Double-check. World in peril? Yep, check. Actually, make that two worlds in peril—the story begins on the idyllic planet Cocoon but later relocates to the surface of its neighbor, the mysterious planet Pulse. At the outset, the government of Cocoon has initiated a planet-wide purge, killing or exiling any citizens who have come into contact with a recently discovered Pulse-being. The game’s six protagonists are thrown together in the resulting chaos and eventually team up, embarking on an epic quest to save both worlds from destruction. Final Fantasy XIII ’s greatest triumph is its presentation. The graphics and art design are real jaw-on-the-floor stuff, especially during the game’s incredible pre-rendered cutscenes. And equally lovely is Masashi Hamauzu’s lush and endearingly genre-hopping musical score, which perfectly complements the ethereal beauty of the game’s visuals. 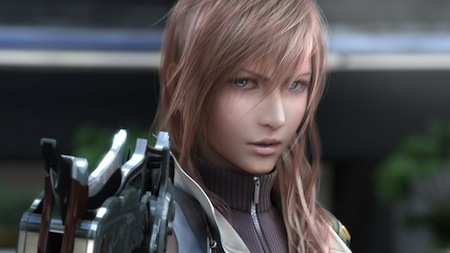 Final Fantasy XIII ’s writing and storytelling, however, are more of a mixed bag. Many of the main characters are well-drawn, particularly the beautiful, brooding swashbuckler Lightning, who is as strong and compelling a female lead as gaming has lately seen. Male leads Szah and Snow at first appear to be boilerplate JRPG stereotypes (jive-talking comic relief and overconfident young dreamer, respectively), but over the course of the game are revealed to be similarly well-written, sympathetic characters. But of course it wouldn’t be a JRPG without a few annoying children flailing about, so Final FantasyXIII gives us the cowardly young man Hope and the slightly older, discomfitingly sexualized young girl Vanille. Both characters, especially the plucky Vanille, are a constant source of irritation, grunting and cooing their way through scene after scene (after scene). A few character gripes notwithstanding, Final FantasyXIII’s story is both epic and consistently engaging. Unfortunately the same cannot be said of the game’s pacing. The first 20-odd hours of its approximately 60-hour length are spent moving in a brutally restrictive straight line, endlessly swinging from battle to cutscene to battle to cutscene to battle again. Initially this linearity lends the game a sense of forward momentum, but things start to get tedious as the hours tick by, particularly when slogging through chapters three through nine. New areas no longer conjure feelings of excited discovery, but rather weary trepidation and bleak mental math: How long is it going to take me to clear this level? The tedium is not helped by the fact that characters keep saying things like, “We cannot look back! We must keep moving forward!” Yeah, I got it, Final FantasyXIII. You’re super-linear. Fortunately the game’s battle system is fun, well-designed and deceptively deep. Battles are fought in real time via the Paradigm System, which allows for immediate re-arranging of party-member roles (i.e. Medic, Spellcaster, Tank, Debuffer). Since players only control one computer-designated character per battle, strategy revolves around timing paradigm shifts to tactically respond to the changing state of the battlefield. The depth of the system doesn’t come close to the likes of Dragon Age: Origins or the Final Fantasy series’ own Tactics games, but on the whole, it has a nice rhythm to it and remains enjoyable throughout. Alas, eye-popping graphics and a cool battle system don’t automatically provide a great gaming experience. Some third element, be it a collection of minigames, deeper side-questing, meaningful choice, more exploration… something else is needed to sustain a game like this for 60 hours of play. When all is said and done, Final FantasyXIII feels unbalanced and strangely unfinished, like a beautifully constructed, lustrously polished chair with only two legs.